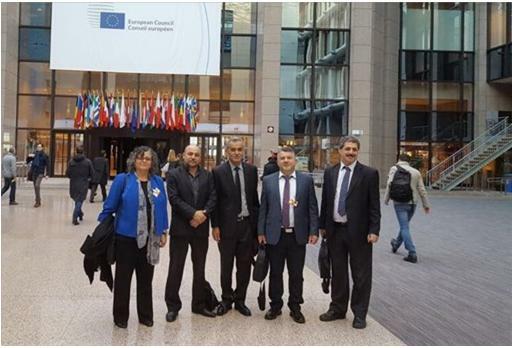 A delegation of MKs from the Joint List arrived in Brussels Monday, November 6, for a series of political meetings at the headquarters of the European Union (EU). Hadash MKs Dr. Youssef Jabareen and Aida Touma-Sliman, and Chairman of the Committee on International Relations, MK Masud Ganaim (Ra’am), and MK Jamal Zahalka (Balad), as well as the chair of the NGO Mossawa ‒ Center The Advocacy Center for Arab Citizens In Israel chair, Jafar Farah, will meet with senior EU representatives and representatives of the various parliamentary factions, as well as the foreign offices of Belgium and France, over the coming week. The delegation will focus on issues relating to the Arab-Palestinian minority in Israel – 20% of the country’s population – emphasizing Israel’s obligation, according to Article Two of the EU-Israel Association Agreement, to respect human rights and to the question of the recognition of Israel as a Jewish state by the international community. They will call attention to the pending Jewish Nation-State bill and will request EU intervention to prevent development of further anti-democratic legislation and policies that contravene the rights of Arab citizens in Israel. The delegation will also raise concerns regarding increasingly commonplace calls for population transfers among high-level Israeli politicians, a plan which threatens to deprive hundreds of thousands of Arab citizens of their citizenship. Finally, the delegation will stress the importance of international diplomatic intervention in the particularly dire situation of the Arab-Bedouin community in the Negev.